This past weekend was full of fun as Air Force and Army went head to head, competing in all kinds of activities! 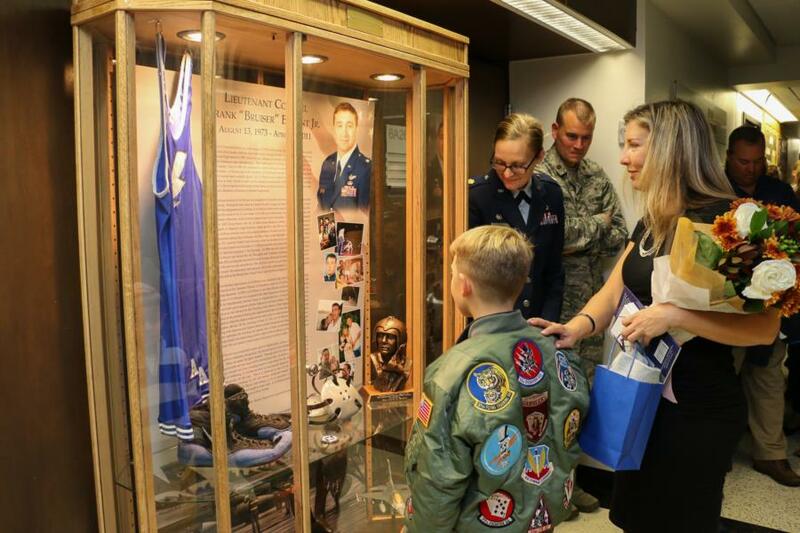 However, during this same weekend the AOG, USAFA, and Cadet Squadron 1 got to honor one of its fallen airmen - Lieutenant Colonel Frank “Bruiser” Bryant, Class of 1995. In attendance, was Lt Col Bryant’s wife Janice (Harriman) Bryant and son Sean Bryant, along with close friends and collages of Lt Col Bryant. 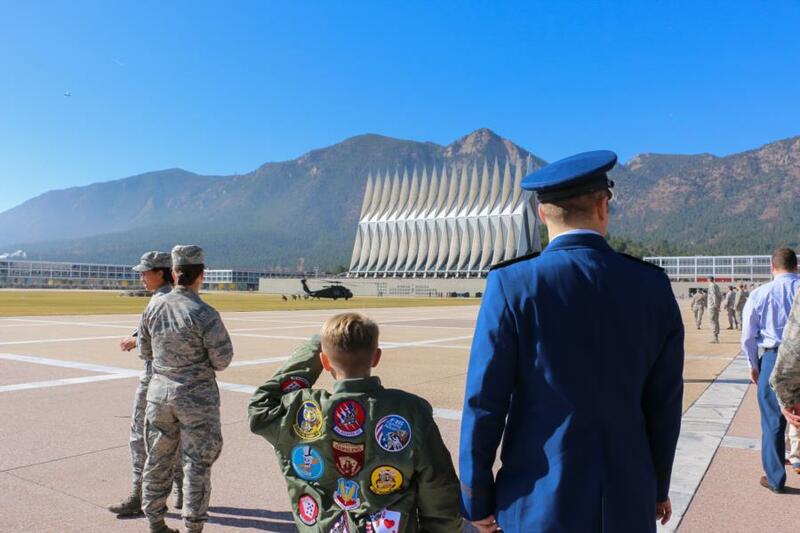 The family had the opportunity to be escorted by cadets from Squadron 1, which was Lt Col Bryant’s graduating squadron. They got to eat lunch in Mitchell Hall with Squadron 1 and see a little glimpse into cadet life. Afterwards, the family watched an F-16 flyover the Academy, which was truly special because Lt Col Bryant flew F-16s. Following the flyover, everyone headed to Squadron 1 for the Dedication Ceremony and the unveiling of Lt Col Bryant’s memorial cabinet. The ceremony was simple and sweet, friends and family got to share a little about Lt Col Bryant and his impact on their life. Also in attendance was Lt Col Bryant’s wrestling coach when he was cadet, helping pay tribute to Lt Col Frank Bryant and his family. Once the ceremony was over, cadets stopped to read Lt Col Frank Bryant's story and see his impact on our country and the United States Air Force. 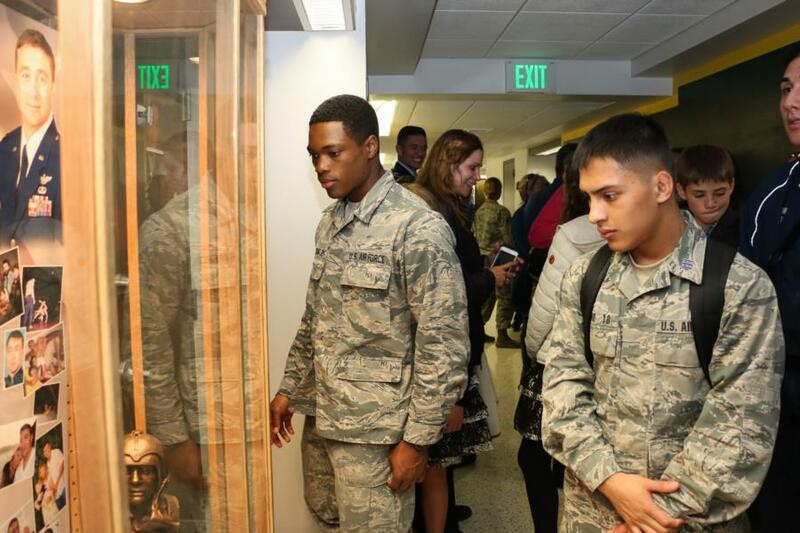 His cabinet will remain with Cadet Squadron 1 indefinitely, honoring his legacy and inspiring future airmen in our United States Air Force. Thank you to all the members involved in making this day possible. It was a beautiful ceremony that honored Lt Col Frank Bryant and his family. Please read the content below to learn more about Lt Col Frank “Bruiser” Bryant and his legacy. Lt Col Frank Bryant Jr. was born August 13, 1973 in Knoxville, Tennessee. He was the middle child of his family, with an older sister and a younger brother. Lt Col Bryant graduated from Karns High School in 1991, where he was a champion wrestler. During his senior year, he won the Tennessee state championship. That same year, Lt Col Bryant joined the U.S. Air Force Academy Class of 1995. He continued to wrestle during his academic career at the Air Force Academy. In his last year at the Academy, Lt Col Bryant was the captain of the wresting team and named most valuable player. Lt Col Bryant was a natural leader. He went beyond his duties as team captain to serve as the squadron commander of Mighty Mach One. In 1995, Lt Col Bryant graduated from the United States Air Force Academy from Cadet Squadron One with a Bachelors of Science in General Engineering. Upon graduation, Lt Col Bryant was assigned to Columbus Air Force Base, Mississippi for pilot training. During his time there he earned his pilot wings and became a T-37 instructor pilot. After his assignment at Columbus, Lt Col Bryant achieved his dream of becoming an F-16 pilot. Over the course of his 16 year career, Lt Col Bryant earned jump wings, senior pilot wings, and a Master of Business Administration degree from Touro University. Lt Col Bryant accumulated over 3,047 flying hours with 121 of those hours being in combat. In 2003, he deployed in support of Operation Iraqi Freedom, where he flew the F-16 on multiple combat missions. One of those missions was a raid aimed at Saddam Hussein and his sons. He served multiple assignments taking him to Kunsan Air Force Base in the Republic of Korea; Shaw Air Force Base, S.C.; and the United Arab Emirates where he severed as an exchange pilot. During his time in the United Arab Emirates, Lt Col Bryant met his wife, Janice (Harriman) Bryant who was a U.S. diplomat assigned to the Embassy. In 2008, the two were married. That same year, Lt Col Bryant was named the Air Education and Training Command (AETC) Top Instructor Fighter Pilot, earning the General William R. Looney III award. In addition to this achievement, Lt Col Bryant was also awarded the 19th Air Force Air-to-Ground Fighter Pilot Instructor of the Year award. His dedication and character led to the achievement of many other prestigious awards such as the Bronze Star, Purple Heart, and Air Force Combat Action Medal. Prior to his final deployment, Lt Col Bryant was attached to the 56th Fighter Wing, Luke AFB, and served as the Assistant Director of Operations and an F-16 Pilot Instructor for the 56th Training Squadron. In 2010, Lt Col Bryant’s son, Sean Bryant, was born. Shortly after the birth of his son, Lt Col Bryant was assigned to the 56th Operations Group and then deployed to the 438th Air Expeditionary Advisor Group in Afghanistan for a 14 month tour. He spoke fluent Dari and built a good rapport with the Afghans he advised in Kabul. During his deployment he served as an Air Advisor for the Chairman Joint Chiefs of Staff Afghanistan-Pakistan Hands Program. In the process of helping the Afghans build their Air Force he uncovered and exposed corruption within the Afghan ranks and devised a plan to curtail misuse of American resources by Afghan officials. On the morning of April 27, 2011, Lt Col Bryant was participating in a meeting with American and Afghani Forces at Kabul International Airport. An armed Afghani Colonel ambushed the meeting and opened fire on those in attendance. Lt Col Bryant was tragically killed in the attack along with six other Air Force officers, an Airman and an American contractor. He was slated to return home to his family in just six weeks. Lt Col Bryant was an incredible leader and F-16 fighter pilot, who proudly served his country. He was brave, dedicated, and genuine. He did not have to be the loudest man in the room to be heard. When he spoke, his peers listened. Through all of his achievements, Lt Col Bryant remained humble and was respected by all who knew him. Lt Col Bryant’s coach recalled him winning a heated and close wrestling match in high school for the state championship title. Instead of celebrating, Lt Col Bryant stood up and proudly shook his opponent’s hand and unceremoniously left the mat. This is a testament to how Lt Col Bryant lived his life. He excelled in everything he did and always conducted himself with a high level of professionalism. Lt Col Bryant will continue to be an inspiration to all service members, exemplifying the core values taught to every cadet. 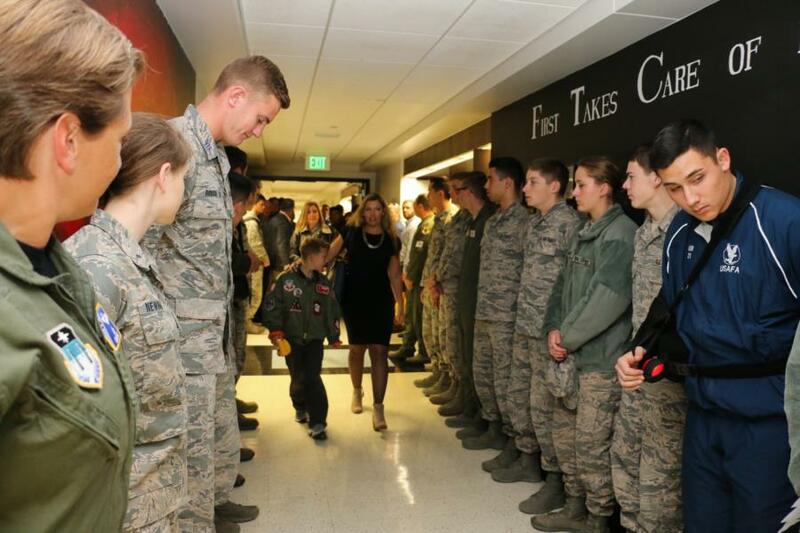 Lt Col Bryant embodied the principles of warrior ethos and what is means to be an Airman. Lt Col Frank "Bruiser" Bryant was a giant among men.